Spanning the history of electronic and experimental music from the early pioneers to the latest innovators. We hope you have enjoyed our broadcasts of Earwaves, which concluded its broadcast on SomaFM on December 30th, 2017. We made another limited edition run of Suburbs of Goa Tshirts. 4-color on black. Designed by the amazing illustrator Josh Ellingson. Get yours with a $50 (plus postage) donation. The links used are affiliate links. By buying through the links we may receive a commission for the sale. This has no effect on the price for you. Or this link to shop at Amazon.co.uk, Amazon.fr, shop at Amazon.ca or shop at Amazon.de. Copyright ©2000-2017 SomaFM.com, LLC. All rights reserved. 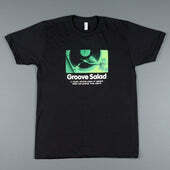 Groove Salad, Drone Zone, Cliqhop, Secret Agent, Space Station Soma, Digitalis, PopTron, Suburbs of Goa and Illinois Street Lounge are trademarks of SomaFM.com, LLC.